The Vanguard Fleet is the personal detachment of Dominion starships and soldiers that accompany the changeling known as Odo. As one of the few Founders with an affinity for life as a solid, he has been placed in command of this fleet in an effort to combat the re-emerging Hur'q threat. Odo's time spent living among solids has given him a greater degree of empathy and understanding for the sanctity of life, including those of his loyal Jem'Hadar soldiers. As such, he has commanded that additional resources and research be pooled toward increasing the Vanguard's technological and logistical superiority, with the purpose of ensuring a greater chance of victory, and reducing or eliminating Dominion casualties. 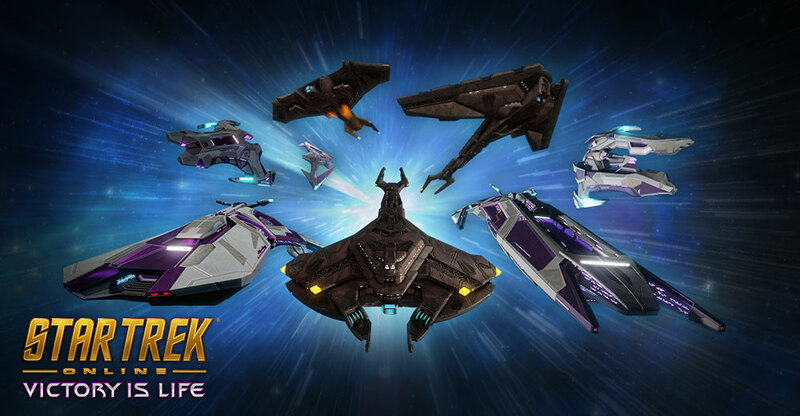 All of the following starships are available now by purchasing the Gamma Vanguard Bundle, and will be available for in-game claim as soon as the Victory is Life expansion launches! Initially, Vanguard Starships will only be available for Jem’Hadar characters to claim and fly. However, we have created a new method by which they can be made available for all other characters on your account, regardless of their allegiance. All Jem’Hadar Vanguard Starships are outfitted with a sixth level in their Starship Mastery progression, beyond the Starship Trait which is still unlocked by reaching level 5. This Level 6 Starship Mastery unlocks the availability for all characters on your account to claim and pilot the mastered starship. Vanguard Starships are issued two loyal Jem’Hadar ace pilots. These expert pilots fly their own Jem’Hadar Vanguard Heavy Raiders in formation with you, never straying far from your side. Their extensive experience in team-based tactics allow them to execute powerful maneuvers for you. Micro-warp to your side, then initiate a forward-facing scatter volley barrage dealing a large amount of damage to any foes in a wide area ahead of you. Increase Shield Resistance and apply rapid Hull Healing for several seconds. May target any ally, including your other Wingman. Focuses on a targeted foe, draining their Shields over several seconds while also weakening their Shield Resistance. All Maneuvers share a cooldown, and only one may be active at a time. Wingmen may not be ordered to attack specific targets, but will instead rapidly update their targeting parameters based on your chosen target. If destroyed in combat, each Wingman will automatically rejoin you after a short lockout period has passed. This enormous vessel supports the Vanguard Fleet by acting as a mobile assault base for the launch and repair of other vessels, while also providing support and tactical superiority. This starship features a Lieutenant Commander Science/Intel Specialist Bridge Officer seat. The Jem'Hadar Vanguard Carrier [T6] comes equipped with the Linked Command Matrix Universal Console. Activating this ability will detach the heavy attack craft from the aft portion of the Jem'Hadar Carrier. After detaching the bulky attack craft, the Jem'Hadar Carrier becomes much more nimble, however its hull and shield HP are slightly reduced. The heavy attack craft will follow you and will attack your target with its weaponry. If it takes heavy damage, it will be disabled and you will need to disengage "Deploy Heavy Attack Craft" and re-dock with the vessel to get it functional again. Using this ability on a Jem'Hadar starship other than the Carrier will cause you to instead summon it to assist you. The Jem'Hadar Heavy Attack Craft comes equipped with Polaron Beam Banks and Arrays and a Quantum Torpedo Launcher. Additionally it has access to the Beam Fire at Will III, Beam Overload II and Torpedo: High Yield I. This console also provides a passive bonus to Hull Capacity and Critical Hit Chance with Energy Weapons. This console may be equipped in any console slot, but many only be equipped on Jem'Hadar Vanguard starships. Only one of these console may be equipped on a starship at a time. While this Starship Trait is slotted, activation of Mask Energy Signature or any Intel Bridge Officer Ability will grant your Hangar Pets a large amount of stealth as well as significantly reducing their threat generation for a short time. Hangar Pets do not break their stealth even while they are attacking. The Vanguard Carrier comes equipped with two wings of Vanguard Gunboats. These new hangar craft are frigate-rank large fighters, built for combat against the Gamma Quadrant’s deadliest threats. Advanced and Elite versions of these Hangar Pets will also be available. Those pets will be outfitted with Rank II and Rank III of all ranked abilities listed above. Frequently acting as the flagship for Dominion fleets, this commanding starship is just as suited to frontline assaults as it is to leading its fellow starships in strategic strikes from a position of authority. This starship features a Lieutenant Commander Engineering/Command Specialist Bridge Officer seat. The Jem'Hadar Vanguard Dreadnought Cruiser [T6] comes equipped with a Dominion Targeting Synchronizer Universal Console. Activating this ability marks an enemy and will moderately reduce their defense and damage resistance rating. Additionally, allies that fire upon this enemy will gain a Weapon Cycle Haste and Weapon Power Cost reduction buff for a very brief time. This buff reapplies each time allies attack the marked target. This console also provides a passive boost to Shield Capacity and Critical Hit Chance with Projectile Weapons. While this starship trait is slotted, activation of Engineering Team, Science Team and Tactical Team will apply a lesser version of these abilities on nearby allies. The Vanguard Carrier comes equipped with one wings of Vanguard Gunboats, as detailed above. When the Dominion needs a heavy offensive powerhouse, this is the new starship of choice to send into the thick of it all. More sturdy and robust than the older Escorts, without sacrificing much in the way of firepower. This starship features a Lieutenant Commander Tactical/Miracle Worker Specialist Bridge Officer seat. This console also provides a passive bonus to Drain Expertise, Critical Severity, and Healing Critical Severity. These nimble light craft are even more maneuverable and evasive than the older Attack Ships seen in action during the Dominion War. Their frequent use in subtle operations that sometimes take them away from the safety of the fleet means they are outfitted to be versatile and capable of performing well in a wide variety of situations. The Jem'Hadar Vanguard Heavy Raider [T6] comes equipped with the Polaron Particle Inverter Universal Console. Activating this ability releases a continuous burst of Antipolaron particles into the area around the starship. Enemies caught in the bursts have their flight speed reduced, have their shield hardness reduced and suffer heavy Radiation damage. Additionally, cloaked enemies will be revealed. This console also provides a passive bonus to Exotic Damage and Control Expertise. While this Starship Trait is slotted and you attack an enemy's rear arc you will reduce their turn rate and grant yourself a brief Tactical and Pilot Bridge Officer Ability recharge time reduction. This buff immediately refreshes each time you land a hit on the enemy's rear arc. This specialized Experimental Weapon is designed primarily to debilitate an enemy's ability to keep their shields intact, but the extreme power contained in the bolts also has the side effect of causing electrical damage to starships it impacts. It has a 360 degree targeting arc. Equipping multiple Consoles from this set of starships will grant additional passive bonuses from the "Vanguard Superiority" item set. 4 Pieces: "Pledged to the Founders"
Now that the Cardassian Union has officially joined the Alliance, they are once again dipping their metaphorical toes into the waters of inter-species politics and intrigue. Given the proximity of the recent Hur’q attack on Bajor, the leaders of the Cardassian Union are understandably invested in offering whatever aid their government can spare. Although still struggling in the aftermath of both the Dominion War and a more recent rebellion by the True Way faction, the reformed Cardassian Union is dedicated to protecting the Milky Way from this emerging threat. And if they can leverage these events to regain a modicum of their former power and influence? That’s what we call a win-win. Intelligence starships feature a Cloaking Device. Cardassian Intelligence ships are fitted with a unique visual effect, as they have had to develop their own cloaking technology. Intelligence vessels passively conceal their energy signatures, causing long-range sensors to have difficulty detecting them. This translates to a small amount of Stealth which renders enemies unable to detect Intelligence vessels if they are beyond short range. Intelligence vessels are capable of performing deep scans on their target to reveal vulnerabilities. Every second, the target of Gather Intelligence will have 1 stack of Penetrating Scan placed on them. Once the target reaches 15 stacks, they become Vulnerable for a short time (Weaker enemies require less stacks to be rendered Vulnerable). Multiple Intel ships can contribute to the number of Penetrating Scan stacks causing the target to become rendered Vulnerable more quickly. While in this state, Intel ships can use Expose Vulnerability abilities on them placing a crippling debuff on the target. After the Vulnerable state expires, the target becomes immune to further stacks of Gather Intelligence for a short time. Recent starship development on Cardassia has changed a lot from the time of the Dominion War, and before. More focus is given these days to sizing up your opponents before leaping into the fray, rather than trusting on the strength of your armaments and skill of your crew. Better to be prepared, than to be dead. The massive Damar-class exemplifies these qualities with its Intelligence gathering capabilities well-tuned to support its rather vast array of scientific capabilities. This flagship vessel is named after the famous (or, some might say, infamous) military leader who redeemed himself in the closing days of the Dominion War by leading a stand against Cardassia's Dominion oppressors, inspiring the people of Cardassia to free themselves from their harsh rule. This starship features a Commander Science/Intelligence specialist bridge officer seat and an Ensign Universal/Intelligence specialist bridge officer seat. This Cardassian starship is capable of deploying a support platform cluster. When activated, your starship will deploy a potent shield generator. After a short time, the shield generator will then deploy 3 Spiral Wave Disruptor Platforms. Additionally, the shield generator will significantly reduce the flight speed, turn rate and shield hardness of foes within it. Spiral Wave Disruptor Platforms are equipped with Spiral Wave Disruptor Beam Arrays and will use Fire at Will II and Beam: Overload I. This console also provides a passive bonus to Scientific Readiness and a scaling bonus to Auxiliary Power that increases as that subsystem's power system is decreased. This console mod can be equipped on any starship. You may only equip a single one of these consoles. These small craft represent an updated design of the Hideki frigates still seen in use around the galaxy. These versatile craft have been refit with abilities designed to impede enemy damage output. Suppressive Armaments - Modulate weapons for 15 seconds, reducing the Accuracy and Damage of any foe attacked. Flight-Deck Cruisers offer a unique blend between defensive capabilities and utility, while deploying strike craft to both assist in combat and distract their enemies, allowing them to fill the role of being forward command stations. The namesake of this vessel - Tekeny Ghemor - was instrumental in laying the groundwork for the reformation of Cardassia and the eventual reinstatement of the Detapa Council. This starship features a Commander Engineering/Intelligence specialist bridge officer seat and an Ensign Universal/Intelligence specialist bridge officer seat. The equipped starship is capable of deploying a durable mobile weapon platform. This platform is bristling with torpedo ports and will frequently unleash a constant withering barrage of photon torpedoes to your target and nearby enemies. This platform will frequently bombard your target with Photon Torpedo Spread barrages. This console also provides a passive bonus to Engineering Readiness and a scaling bonus to Shield Power that increases as that subsystem's power system is decreased. While this starship trait is slotted you will gain a stack of Calm every few seconds while in combat. Each stack of Calm grants a small amount of damage resistance. Exiting combat will clear all stacks of Calm. Once you have 10 stacks, all stacks of Calm are cleared and you gain the Storm buff. While under the effects of Storm, you will gain a buff to Bridge Officer Ability Recharge Speed and Weapon Firing Cycle Haste. The Ghemor-class comes equipped with one wing of Cardassian Yukuwa Frigates, as detailed above. Of course, even a cautious approach needs forward scouts, and the Detapa-class Intel Escorts are the perfect blend of reconnaissance vessel and forward strike crew. These nimble vessels bear the honor of being named after the reinstated civilian government of the recently-reformed Cardassian Union. This starship features a Commander Tactical/Intelligence specialist bridge officer seat and an Ensign Universal/Intelligence specialist bridge officer seat. This console utilizes unique Cardassian weapons technology to emit a massive burst of deadly "spiral-wave" disruptor energy in a wide arc in front of the vessel. Enemies caught in the blast wave will suffer heavy Disruptor damage and have their damage resistance reduced significantly. This console also provides a passive bonus to Tactical Readiness and a scaling bonus to Engine Power that increases as that subsystem's power system is decreased. Remodulated Weaponry: You gain a large boost to your Shield Penetration skill for the duration of combat. Primed Weaponry: You gain a large boost to your Hull Penetration skill for the duration of combat. Defensive Strategy: You gain a large boost to your Hull Plating skill for the duration of combat. Ready for Anything: You gain a large boost to Engineering Readiness, Science Readiness and Tactical Readiness skills for the duration of combat. Equipping multiple Consoles from this set of starships will grant additional passive bonuses from the "Reformation Reinforcements" item set. 3 Pieces: "Spiral Wave Expertise"